"Themis Group of companies (Themis) have been looking after my business accounts, audit, tax and GST submission for more than 2 years. Their professional advice and services have been invaluable over the past 2 years. 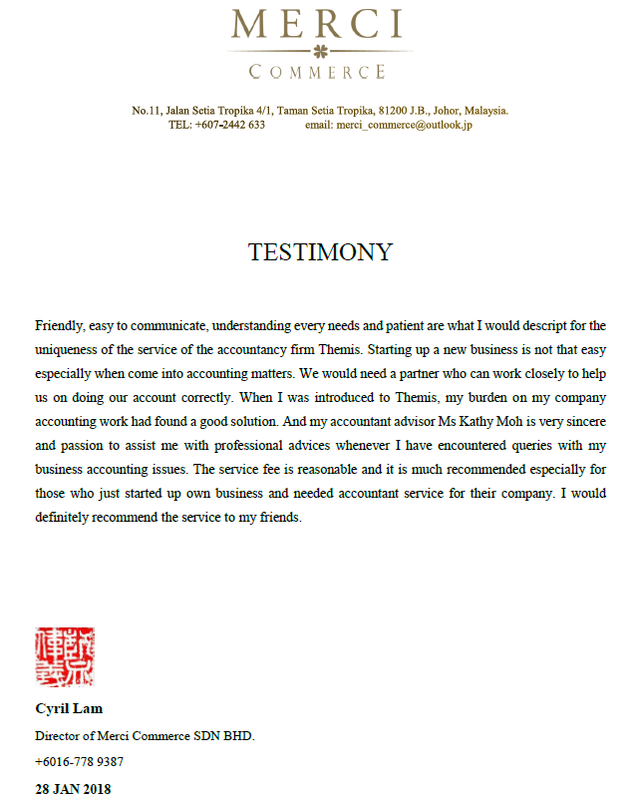 The service provided by Kathy Moh (Accounts) has been and continues to be exceptional. 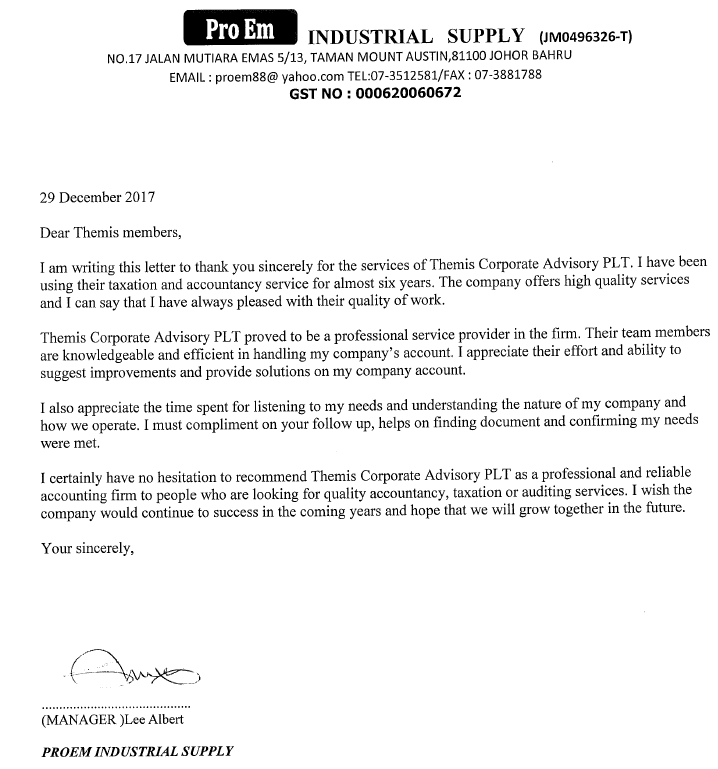 Friendly reminders that the GST is due, to efficient and thorough preparing and auditing of company accounts, and taxation are indeed commendable. This helps me to concentrate on growing my business rather than worrying about endless paperwork." "Friendly, easy to communicate, understanding every needs and patient are what I would describe for the uniqueness of the service of the accountancy firm Themis. Starting a new business is not that easy especially when come into accounting matters. We would need a partner who can work closely to help us on doing our account correctly. When I was introduced to Themis, my burden on my company account work had found a good solution. And my accountant advisor Kathy Moh is very sincere and passion to assist me with professional advices whenever I have encountered queries with my business accounting issues. The service fee is reasonable and it is much recommended especially for those who just started up own business and needed accountant service for their company. I would definitely recommend their service to my friends." "I have been using Themis group for my company secretary, accountancy services, audit and tax since I started up my business in Year 2013. Mellie and her team made it so easy to set up my company, and look after all my taxation needs, making it far easier for me to concentrate on my business rather than worrying about endless paperwork." "I have been using their taxation and accountancy service for almost six years. The company offers high quality sevices and I can say that I have always pleased with their quality of work. Themis Corporate Advisory Plt proved to be a professional service provider in the firm. Their team members are knowledgeable and efficient in handling my company’s account. 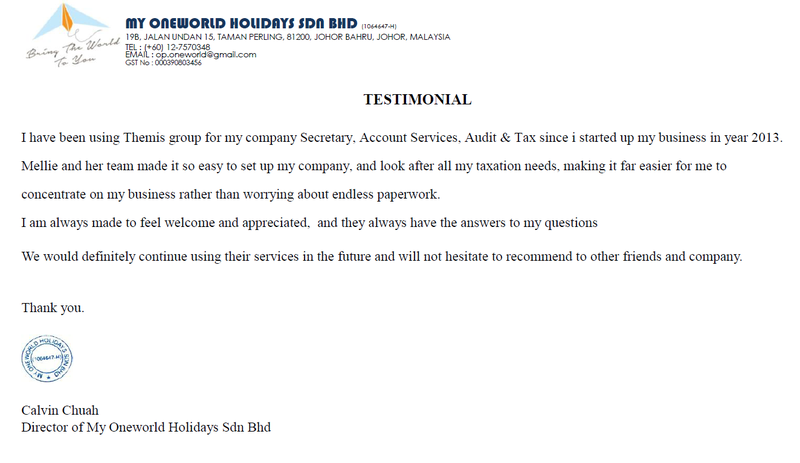 I appreciate their effort and ability to suggest improvements and provide solutions on my company account." "Themis Responsiveness is probably the best things about them. Any question, no matter how simple they seem, has been handled quickly and professionally. 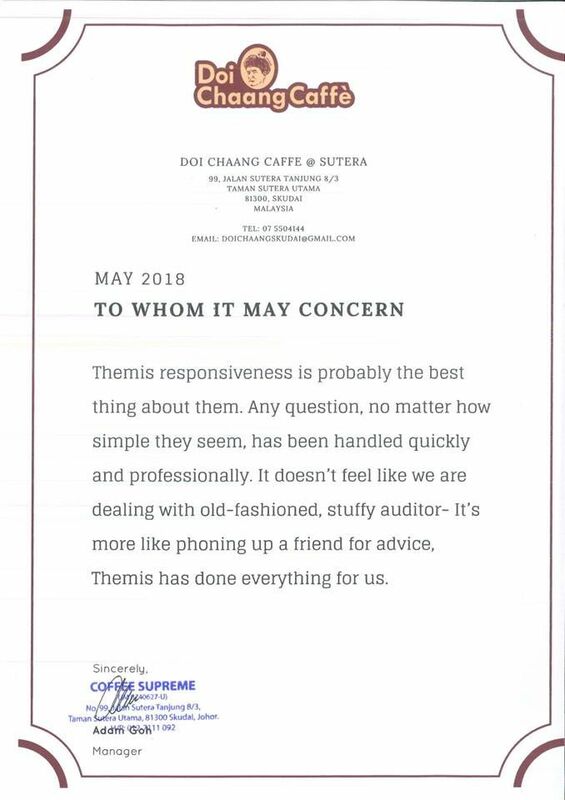 It doesn’t feel like we are dealing with old-fashioned, stuffy auditor – It’s more like phoning up a friend for advice, Themis has done everything for us." "How times flies, we have been working with Themis and his team for ten years. They provide us with expert advice in relation to our annual accounts and tax. The team are professional, and always give clear advice and guidance in a prompt and efficient manner." J & S Soft Furnishing Plt. "This is a quick, effective team that really cares for their clients success. Themis is guiding us from company set up to our business operations. We avoid lots of detours and mistakes by engaging their services." "We have been cooperating with Themis for several years. I can say that Themis is definitely one of the best secretarial firm in town. As a certified company secretary, they will guide their clients from setting up their company (Sdn. Bhd.) until the business grow mature. They explained to their client all necessary informations they need to know as a business owner (Shareholder and directors) in Malaysia, this helps a lot in avoid unnecessary penalties (e.g. Companies Commission of Malaysia, Inland Revenue Board, Royal Malaysian Customs Department and etc). Therefore without hesitation, we will recommend Themis with confidence." "It was awesome to work with a company that was able to adapt to our needs so readily and effectively. Thank you all again for your efficient support. We look forward to growing our company with Themis in future." "Themis consultants are responsive, knowledgeable, experienced and trustworthy. We have been very impressed by their help. It makes a foreign company like us easily adapt to Malaysia environment and market." "All of our companies have been engaging Themis services for many years, they are providing efficient and professioanl services with reasonable price." "I appreciate Themis's helps on my limited liability partnership set up and subsequence statutory compliance. They are always helpful and solve my doubts in a professional way. Million thanks and super like Themis services!" "Themis has been helping us to handle account issues since 2014, and always been a good help, giving us hassle-free life. We appreciate their help and especially our account person-in-charge, Kai Tian, who always patiently explain and settle our problem regarding account issues, even after work. We would carry on using Themis service and recommend to our clients and partners."